Precious Moroccan argan oil with soothing rose otto oil. 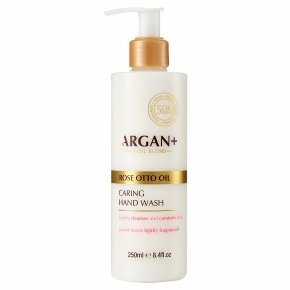 For soft, pampered hands.Argan+ Soothing Hand Wash is a superior creamy formulation designed with 'miracle oil' Argan Oil, rich in Vitamin E, and lavish ingredients to leave hands gently cleansed and comforted. Blending exquisite Rose Otto Oil with a unique Argan+ Synergy helps to deliver a luxurious cleansing experience for your hands, leaving them delicately fragranced and softly soothed. Argan+ Synergy is an all-natural 100% blend of precious Moroccan Argan Oil with 4 other amazing oils: Baobab, Kukui, Moringa and Sacha Inchi, all selected for their restorative, regenerating and nourishing properties. Directions for Use: Pump once or twice into your hands, rubbing hands together to create a light foam before rinsing with water.